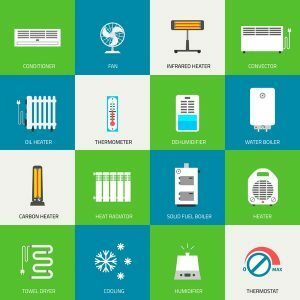 4 Benefits of Heat Pumps and Why You Should Consider One | Desert Suns Heating & Cooling Inc.
Are you looking for a new heating system for your home in Albuquerque? A heat pump is a great option to consider. A traditional set up for heating and cooling your home is a split system where you have two split systems (one furnace and one AC unit) to heat or cool your home when you need it. We’re lucky to live in a climate with short, relatively mild winters so a heat pump is a great system to heat your home. Heating your home is never a one-size-fits-all endeavor. If you really want heating that satisfies, you need one of our professionals on the installation job. We’ll visit your home, assess your needs, and help you find the right make and model heater. If you’re considering a heat pump in Albuquerque, NM, then contact our team today. A traditional heater or air conditioner works differently than a heat pump. A heat pump doesn’t generate heat like these systems; it absorbs heat from the outside air and moves it inside to keep your home warm. This process helps you save money on energy usage because it doesn’t force the system to generate heat constantly. Furnaces are a much more common system used to generate heat in a home, but their downside is they generate a lot of energy at a high capacity. As we mentioned above, heat pumps are highly efficient because of the way they generate heat. If you’re switching from a different type of heating system, you’ll probably be surprised just how efficient a heat pump can be. When you opt for a heat pump and you don’t burn through as much energy to heat your home, you’ll see a positive reflection in your energy bills. Lower energy expenditure means lower heating bills for you. One of the best features of a heat pump is its ability to both heat and cool a home. What makes a heat pump unique is a four-way valve called the reversing valve. This valve sits in the refrigerant line and changes the direction the refrigerant flows, allowing the heat pump to heat in the winter and then reverse this function in the summer to cool your home. This type of two-in-one system is incredibly convenient and great for a climate like ours. Another benefit of a heat pump is its quiet operation. Heat pumps generally make less sound compared to other HVAC systems because the main mechanical component (the compressor) is placed outdoors rather than indoors. Deciding you want a heat pump for your home in Albuquerque is a great option for our climate. If you’re looking for the perfect system for your home, you’ll need the help of one of our professionals. We’ll help you find the perfect system for your needs rather than just a merely adequate system. If you want to install a heat pump in your home, contact Desert Suns Heating & Cooling Inc.